Peter Jackson’s stunning Oscar-winning The Lord of the Rings movies, based on the fantasy novels by J.R.R. Tolkien , are even more impressive in the Blu-ray Extended Editions Trilogy. In high-definition, the epic films pop off the screen. The blacks are darker and deeper, giving the picture more depth, and the colors are brighter, leaving scenes with an almost surreal feel. The hobbits’ Shire, for example, is such a bright green, it’s as though it’s straight out of a fairy tale. The 6.1 DTS-HD sound is great too, clearer in all its roars of Orcs, clashes of swords and suitably quiet during the times of meaningful dialog. The score sounds amazing flowing out of the speakers. If you close your eyes, you could almost imagine being in the land of the Elves. As good as they are, it’s a shame that the films are still on two discs. You’d think that with the bigger capacity of Blu-ray, the movies could finally be watched without having to swap discs halfway through, but no. As with the DVD, the films are held over two discs. 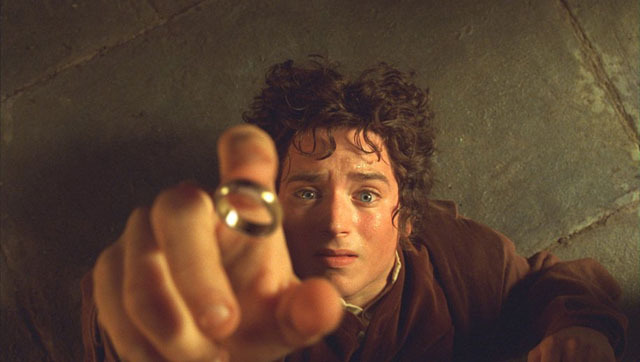 The Trilogy set includes the extended editions of all three films — The Fellowship of the Ring, The Two Towers and The Return of the King — and it’s the only way to own these longer versions of the movies. They are not yet available individually. The versions of the films that ran in theaters have been released on Blu-ray in a Trilogy set and separately. 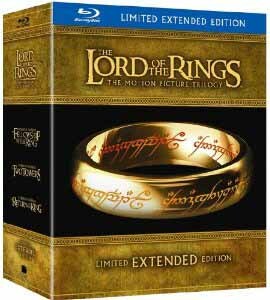 The Blu-ray Extended Editions contains all the special features from the DVD set , which is extensive. Yep, all the Appendices and photos and commentaries. If you haven’t already seen them on the DVD, trust me, they’re all good and worthy of a repeat performance on this Blu-ray. What’s new in this set are three behind-the-scenes documentaries — yep, more of them — by filmmaker Costa Botes, who shot hours and hours of footage during the movies’ production. He edited them down to three feature-length documentaries, one on each film, and they’re only available within these discs. The documentaries are a lot of fun to watch, if perhaps a little tiring. With no narration, or even a particularly obvious throughline, they play like very long YouTube mash-ups. They offer behind-the-camera pranks (mostly by Billy Boyd and Dominic Monaghan, who at one point pretend to hide a blow-up doll in their trailer), action mishaps (one actor has to get stitches in his head after a particularly enthusiastic swordfight) and filmmaker issues (during Return of the King, Jackson’s 3D camera film was accidentally thrown away and, after an exhaustive search, later found in the garbage skip). The films also give fans more of an idea of the personalities of the actors and filmmakers, including Ian McKellen, Viggo Mortensen, Ian Holm, Elijah Wood and others. Jackson himself seems to be always joking, such as one day when snowfall stopped production and Jackson jokes to the camera that they got a wonderful new snow machine that managed to blanket the whole area, unfortunately, they can’t figure out how to turn it off. As we look forward to the release of Jackson’s The Hobbit in December 2012, it’s funny to hear Jackson bemoan the complexity of directing LOTR, saying he’ll never direct another movie that requires this much special effects work. We’re guessing he’ll probably say the same thing on the Blu-ray for The Hobbit.